Transformations of the city have a direct influence on the lives of millions of people, not to mention a notable impact on the environment, making them the principal drivers of national economic development. This development must be pursued by adopting coherent and focused policies, involving diverse actors in the obtainment of elevated levels of spatial quality. This approach can no longer be separated from a broader vision of the city that brings together the multiple and variegated elements of a social and economic reality. 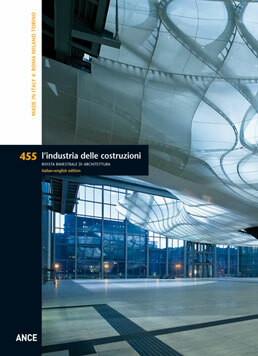 This issue presents three Italian cities – Rome, Milan, Turin – illustrating the architectural results of a number of important projects against the backdrop of transformation strategies implemented over the past twenty years. The aim is less to compare policies and results than to examine the ample spectrum of positive changes and the state-of-the-art of Italian architecture in the early twenty-first century. We begin in Rome, the largest municipality in Europe, the largest historic centre in the world and the city with the greatest resistance to change and the most problems of the trio. Rome is also the city with the highest number of unfinished projects in recent years, a condition that merits reflection, where many of the renewal urban programmes forecast in the new Master Plan have yet to produce concrete results and where the efforts made to date have proven insufficient to creating a truly European metropolis. Three projects stand out for their architectural and urban quality within this anything but positive scenario: the “nuvola” by Fuksas that, finally, almost twenty years after the international competition and the complex and laborious events surrounding its construction, was recently inaugurated. 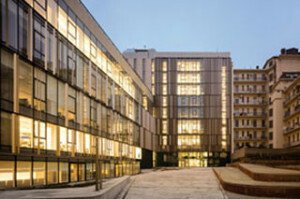 Despite the passing of the years, it is both “spatially stimulating and technologically innovative”; the new headquarters of BNL-BNP Paribas Real Estate by 5+1AA, which completes the urban renewal begun with the new Tiburtina Railway Station, an imposing project that competes with analogous operations in other European contexts; finally, the new San Giovanni Station on the city’s C Line, inaugurated only a few months ago, and the result of a virtuous synergy between Metro C spa, the Soprintendenza per i Beni archeologici and the Dipartimento di Architettura e Progetto at the Sapienza University of Rome. Milan offers a different situation than that found in the capital. Here, the transformation of former industrial areas inside the city, improvements to infrastructures and services and the rehabilitation of public spaces have together managed to construct a new identity and allow the city to compete with other European metropolises. Of the many well-known projects completed in Milan, two recent works are striking: the Feltrinelli Foundation, designed by Herzog & de Meuron and the elegant Pentecoste Parish Centre by Boris Podrecca and Marco Castelletti. Finally, Turin. Once the industrial heart of Italy, the city has managed over the course of little more than a decade to put on a new face and transform itself into a new reality where urban quality, culture and innovation play a leading role. It is within this scenario that we find, among others, the new offices of the Reale Group by Iotti e Pavarani with Artecna, a solid and elegant intervention that offers tangible proof of the wholly Italian ability to work with skill and a sense of scale to insert new architecture into consolidated urban contexts. The New EUR Convention Centre has finally been completed, eighteen years after the international competition that selected the winning project. 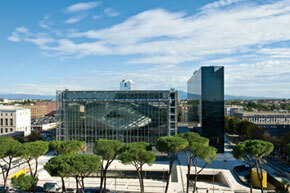 The new Rome-EUR Convention Centre, one of the most relevant programmes in Rome of the past 50 years, risked becoming the latest cathedral in the desert. Hence everyone greeted its inauguration last 29 October as an act of liberation, and the herald of a cathartic regeneration, a hope for the rebirth in Rome of a new season of architecture.V The final project consists of more than 55,000 m2 of space for conventions, an 1,800-seat theatre-auditorium, exhibition spaces, parking (more than 600 stalls on three levels) and a hotel (17 storeys and 439 rooms). This multiplicity of uses and flexibility are the essential characteristics of the complex, which provides a range of different sized spaces, some fixed (four 100-seat halls), others unitary (8,000 m2) and able to be modified in their functional organisation. The new BNL and BNP Paribas Real Estate Group headquarters in Rome have recently been completed, after only five years.The building, designed by 5+1AA, prefigures a part of the city of rare intensity and vigour, an almost Piranesian fragment in the wide ocean of the capital, which appears to have lost the memory of the meaning of “substance” in architecture.The new BNL-BNP Paribas headquarters is a prestigious element in the process of urban renewal that also includes new roads, more fluid than their predecessors, together with the improvement of municipal services, including the rehabilitation of the surrounding area, also for those who work inside of it. The work establishes a dialogue, to some degrees just under the surface, to others strongly manifest, with the Tiburtina Railway Station, designed by ABDR, the principal hub for north-south high-speed rail traffic along. 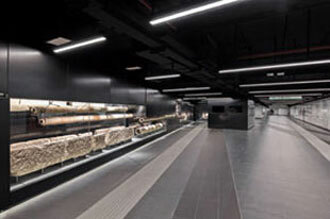 The new C San Giovanni metro station, the result of virtuous synergies between the Metro C spa company, the Superintendence for Archaeological Heritage and the Department of Architecture and Project of Sapienza University of Rome, was inaugurated only a few months ago. The project brilliantly unites infrastructure with archaeology, demonstrating that what once represented an obstacle to the improvement of public transportation in the city may instead constitute an opportunity for immerging citizens in the history and rich layering of Rome’s soil. A thirty-meter stratigraphic excavation in the heart of Rome leads to the subway docks preparing a journey back in time. Archeology and infrastructure cohabit in a deep hypogeum: the first set up with fragments and findings found, the second built as an important junction of a strategic infrastructure for the city and long awaited. The new home of the Fondazione Giangiacomo Feltrinelli, a majestic glass and concrete prism flanking Viale Pasubio near Porta Volta in Milan, is a treasure chest sheltering a library and archives of exceptional value. The material has been collected since 1949, when Giangiacomo Feltrinelli decided to earmark a significant portion of his inheritance to the creation of a library documenting the history of the workers’ movement and the democratic movements of the Italian Risorgimento. Conserved in Feltrinelli’s offices in Via Scarlatti, the library – now the Istituto Feltrinelli – was moved during the 1960s to Via Romagnoli, a few meters from the headquarters of the publishing house, near the Central Railway Station, where it remained for forty-five years. The profound and recent transformation of the Porta Volta district most likely convinced the family that this site could be the correct location for the new home of the Foundation.The long volume resembles a sharply cut prism. It exudes a sense of monumental “permanence”, expressed through the form of the building. Some years ago, the CEI, the Italian Bishops’ Conference shot to international attention within the architectural community as the client of a number of new churches and parish centres across Italy. 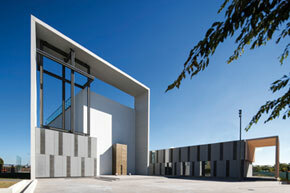 In 2001 a competition was announced for the construction of the new Pentecoste church in Quarto Oggiaro, Milan. The new project consists of three volumes: the church, the tallest of the three, the chapel dedicated to the Virgin Mary and the weekday chapel, and the parish centre. This latter volume is linked to the church by a long glazed gallery supported by a steel frame. 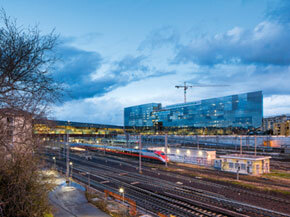 Light plays a particularly important role in the project. It enters from above moving across the walls of the large, 18-meter high longitudinal hall; it is diffuse and diaphanous, thanks to the large surface in alabaster glass behind the main altar; it is direct, entering through the windows defining the rhythm of openings in the “wooden mantle” cloaking the ceiling and part of the south wall. 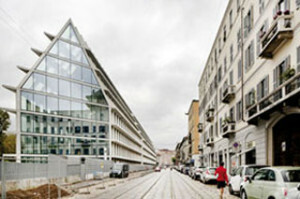 The building designed by Iotti+Pavarani, together with Artecna, for a city block in Turin, is paradigmatic of this situation. Its presence is discrete and assertive at the same time; it inherently contains the sense and rule of the urban fabric, and in so doing sits naturally along the difficult margin separating figure from ground: it is present and, at the same time, in no way invasive. Furthermore, it demonstrates once again how Italian architecture is comfortable when dealing with the urban fabric, when it is grafted onto it, and how it shows its greatest potential at the medium scale. The work of Iotti+Pavarani is a graceful Italian architecture, a carefully laid out architecture, in which the design of the envelope becomes determinant, as if clothing represented a substantial part of the body. However, beyond figurative aspects, what is important to note in this work is the ethical interpretation of architecture: an upper middle class ethic that, because it is still trendy to be anti-middle class, is denigrated, to the paradox of becoming a negative value.